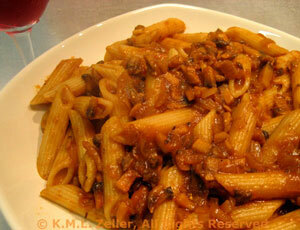 Savory Pasta with Wild Mushroom Sauce, easy recipe, Thyme for Cooking. A simple sauce, but using fresh, autumnal wild mushrooms elevates this to something for the most discriminating gourmet. It's also good with regular button or cremini mushrooms. Finely chop onion, garlic and mushrooms. Heat oil in nonstick skillet over medium heat. Add paprika and sauté briefly. Add onion and sauté until tender, about 7 minutes. Add garlic, mushrooms and sauté until everything is well-cooked, another 7 - 8 minutes. Add stock and tomato paste, stir well. Simmer, uncovered until sauce is thickened. Add drained pasta, toss well and serve.